This is kind of a conundrum because this particular pastor downloads sermons from the internet and passes them off as his own and has for quite some time. I have watched him use sermons that he downloaded and preach them word-for-word from the download while throwing in phrases “When I studied this text, I arrived at” and then he would continue to preach word-for-word from the downloaded sermon. It is one of the reasons that I stopped serving under him even though I do truly love him (The wife and I helped him buy a car when his car broke). He also continually talked about his worldly passions from the pulpit. Matthew 1:18 (CJB) 18 Here is how the birth of Yeshua the Messiah took place. Make me Kadosh Kadosh L’cha. That my heart’s desire is to You draw near. Spirit come and fill, so that I can more, follow and obey. 1990a †‏קֹדֶשׁ‎ (qōdesh) <H6944> apartness, holiness, sacredness. qādôsh. Holy, Holy one, saint (ASV, RSV similar). The adjective qādôsh (holy) denominates that which is intrinsically sacred or which has been admitted to the sphere of the sacred by divine rite or cultic act. It connotes that which is distinct from the common or profane. God is intrinsically holy and he calls his people to be holy, providing for them the standard of obedience whereby that holiness may be maintained (Leviticus 19:2ff.). Because God is holy, he is free from the moral imperfections and frailties common to man (Hosea 11:9) and can be counted on to be faithful to his promises (Psalm 22:3-5). This aspect of God’s character forms the basis of Habakkuk’s hope that his people would not perish (Habakkuk 1:12). The title “The Holy One of Israel” is applied to God numerous times in the OT, but is especially frequent in the prophecy of Isaiah (in all parts). It serves to place the sins of Isaiah’s society in stark contrast to God’s moral perfection (Isaiah 30:11) and expresses God’s absolute separation from evil (Isaiah 17:7). The inviolability of the spheres of the sacred and the profane forms the ground for the ethical aspects of the concept of holiness. Because God is holy, the Israelites could not serve him when they persisted in their idolatrous practices (Joshua 24:19ff.). They were to be separate from all that was unholy (Leviticus 11:11-15; Deut. 14:21). Stipulations were imposed on them that they might not engage in practices common to other peoples (Leviticus 19:2; Leviticus 20:7; Numbers 15:40). Their call to holiness was based on the fact that they had become God’s possession by virtue of his separating them from the nations (Leviticus 20:26; Deut. 7:6; Deut. 14:2; Deut. 26:19). It is unthinkable that a holy God could condone sin; such a concept would involve a diffusion of the sacred and profane, thus destroying the nature of holiness.The call to be holy was accompanied by the imposition of certain restrictions that served to ensure the continuing holiness of those who believed (Leviticus 11:44-45; Leviticus 19:2ff. ; Deut. 14:2, 21; Numbers 15:40). Various aspects of the cultus were denominated holy by virtue of their being conceived of as belonging to the realm of the sacred and were not to be treated as common. This included portions of the sacrifices (Leviticus 6:16; Leviticus 7:6), the temple and its aspects (Psalm 65:4 [H 5]; Leviticus 6:16, etc. ), and the priests (Leviticus 21:6, 8) and Levites (2 Chron. 35:3). The presence of God within the world delineated a sphere that was holy, for God’s holiness cannot be diffused by the common (Deut. 23:14). That which is “holy” is not only distinct from the profane but in opposition to it as well. God, therefore, hates and punishes sin (Joshua 24:19; Isaiah 5:16, 24). In the light of God’s holiness, Isaiah saw himself and his people as sinners (Isaiah 6:3; cf Isaiah 6:5). R. Laird Harris, Gleason L. Archer, Bruce K. Waltke, ed., “1990: ‏קָדַשׁ‎,” in Theological Wordbook of the Old Testament, (Chicago: Moody Press, 1980), WORDsearch CROSS e-book, 788. The adjective qādhôsh is used in the ancient Near East to describe the gods as unapproachable, fearsome beings with power over humans. Holy things, places and people were those which were dedicated to the special service of the gods. In the OT, qādhôsh refers to dedication to the exclusive use of the Lord. It is also used of the Lord himself, but with a great difference from the ancient Near Eastern attitude. 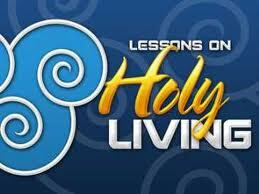 In Leviticus, where holiness is the central theme of the Book, the famous call to be holy as the Lord is holy is given four times: 11:44f; 19:2; 20:7, 26. The context gives the content of this holiness as avoiding all evil and things associated with evil and death called uncleanness. What is evil or sin is defined by God’s character revealed in his laws and instruction through Moses, summed up in the Ten Commandments. Thus, being holy as the Lord is holy means living in accordance with his high moral character revealed in his Word. This is unlike the ancient Near Eastern view of their gods and holiness. They did not associate morality with deity or holiness. Their gods were more evil than they were. Part of the temple personnel were prostitutes called “holy girls” (Gen. 38:21; cf. male cult prostitutes in 1 Ki. 14:24). Qādhôsh is first used of God’s people, Israel, in Exo.19:6, where He says they are to be a holy nation. That meant that Israel was a nation that belonged to the Lord, and so their whole purpose for being was to carry out his mission in the world. They were to be a living testimony of Who God is and the relationship He wants to have with people. This is elaborated in Deut. 7:6; 26:19, and especially 28:9, where they are told that the condition of the covenant relationship is to obey his Word and walk in his ways. In Deut. 28:10, holiness is associated with other people being able to see that Israel is called by God’s name, meaning they demonstrate allegiance to Him, reflecting his character and carrying out his purposes. Leviticus 20:7f equates being holy with sanctifying themselves, and it calls for people to be holy because the Lord is the One sanctifying them. In v. 26, God says the call to holiness is because He has set them apart, or distinguished them, from the other peoples to be his people. Thus, they are a kingdom of priests. Priests were mediators chosen by God to minister between Him and the people. No one else was allowed to come near to his holy presence (cf. Num. 16:7; Lev. 21:8; 1 Sam. 6:20; 2 Chr. 35:3). Israel had a special privilege for a special responsibility of bringing God’s offer of salvation to the world and the world to God. Elisha, as a prophet in special communication with God, is called “an holy man of God” in 2 Ki. 4:9. A Nazirite was one who made a special dedication to the Lord for a period of time, during which he was said to be holy (Num. 6:5, 8). This showed God’s ultimate intention that all his people live as holy and totally separated to Him as priests did. God’s people, in general, are called holy ones in the Psalms (e.g., 16:3). Angels are also referred to as his holy ones in Job 5:1; Ps. 89:7; and Dan. 8:13. Both humans and angels are probably meant in Zech. 14:5. The place where God meets with people is called the holy Place, used especially often in Leviticus. The camp was to be holy (Deut. 23:14). Holy water is referred to in Num. 5:17. The only other use of the adjective, besides for God, is of special days. The Sabbath is called “my holy day” by the Lord in Isa. 58:13, and it was to be honored. Nehemiah 8:9ff calls Israel’s celebration of New Year’s Day a holy day, or sacred to the Lord. The day was not to be a time of grieving. Joshua says the Lord will not tolerate sin and rebellion because He is holy (Josh. 24:19). The holiness of the Lord as revealed in the Scriptures involves moral purity and separation from sin. Holiness in people means a faithful relationship to the holy God, which reflects his moral character values. He is the One Who sanctifies, that is, Who makes people able to come into his holy presence and fellowship with Him by taking away the effects of their sins toward Him (cf. Lev. 20:7; 21:8). He did this by providing the ultimate substitutionary sacrifice for sins (his Son), for all who will repent and believe. His name is holy, according to Ps. 111:9 and Isa. 57:15, which means all that He is is holy. His reputation is awesome and all that He has done is to be praised. Holiness is not just one attribute of God. It sums up what it means, according to the Bible, to be God—the One True God. He is separated from all evil and is distinct from all else because He is the Creator of all; He spoke it all into existence. Thus, as holy, God is transcendent. Holiness sums up all that He is and that He is separated to himself. As a holy God, He is true to his character and nothing can sidetrack Him from his purposes, which are good for his creation. Often, in Isaiah, the Holy One is called the Redeemer of his people. Thoralf Gilbrant, ed., “7202,” in The Complete Biblical Library Hebrew-English Dictionary – Pe-Resh, (Springfield, IL: World Library Press, Inc., 1998), WORDsearch CROSS e-book, Under: “7202”. The call to be holy was accompanied by the imposition of certain restrictions that served to ensure the continuing holiness of those who believed (Leviticus 11:44-45; Leviticus 19:2ff. ; Deut. 14:2, 21; Numbers 15:40). If you read all of my 3 part series on THE LARGEST CHURCH (EKKLISIA) IN AMERICA on WordPress https://evenifministries.wordpress.com/, you are well aware of what kosmos or “worldly” means from the biblical perspective. Worldly is in direct opposition to God. You can NOT be worldly and be Holy (see any of the above explanations for Holy). Part 2 and part 3 are taking an in depth look at this verse biblically and expounding and amplifying it. Okay, what is the point? It is simple and it is not so simple. If you teach a sermon on how to live a Holy life and understand what Holy means, then you teach that sermon based on the precepts of God as the foundation of that teaching. However, if you teach a sermon on Holy living but DON’T understand what Holy means, or rationalize that Holy and Worldly are compatible, you pervert the Word of God. You pervert His precepts, you pervert His commands, and you pervert Him! If you live a worldly life loving worldly things while preaching on Holiness, what message are you sending? If you are to be a light IN the world and NOT OF the world, how dim is that light when you are of it? what makes you think you will want to later? Or after you die? Will it happen by osmosis that you no longer care about worldly things after you die? This entry was posted in Living life Even if . . . and tagged christianity, even if, holy, Joel Chernoff, KaDosh, worldliness. Bookmark the permalink.